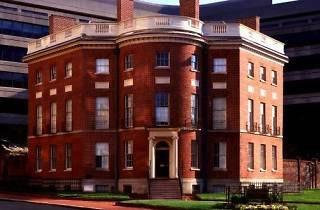 Designed for its odd-shaped lot by Dr William Thornton, first architect of the Capitol, this elegant brick mansion was completed in 1800. The aristocratic Tayloes offered it to a fellow Virginian, President Madison, when he was made homeless by the 1814 White House fire. More like a pregnant hexagon than an octagon, the house—reputedly haunted—is a gem of light and proportion. 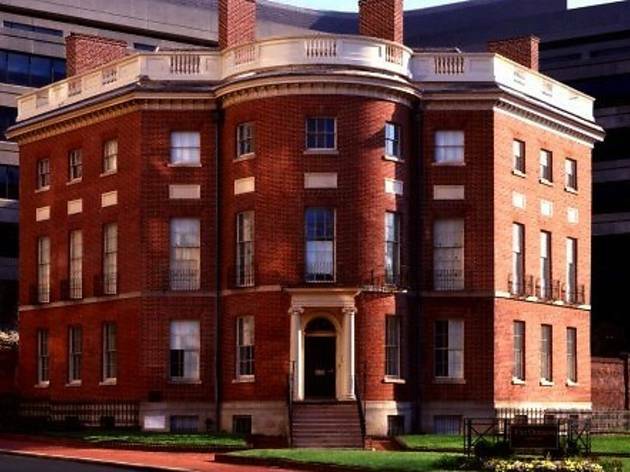 The related American Institute of Architects headquarters are next door; hence the Octagon hosts topical architectural exhibitions as well as Madison-era furnishings—including the desk where Madison signed the Treaty of Ghent in 1815, ending the war between the US and Britain.